It is getting difficult to show any new progress on the track work for Time Traveler as we are to the wiring stage and honestly that's not overly exciting. But we will still entertain you with photos of the track. There was some activity today by the workers. For now, you can see the final over banked turn. They have made a lot of progress on the maintenance bays. The more visible progress has been made on the structure at the exit. I'm wondering if this will become a "cuckoo clock" opening considering the backstory is that the guy is a clock builder. Some of the details on the side of the building facing the midway. This will be the exit of the shop. I really like this bay window on the front facade. Here is the back of the building - facing the actual ride. 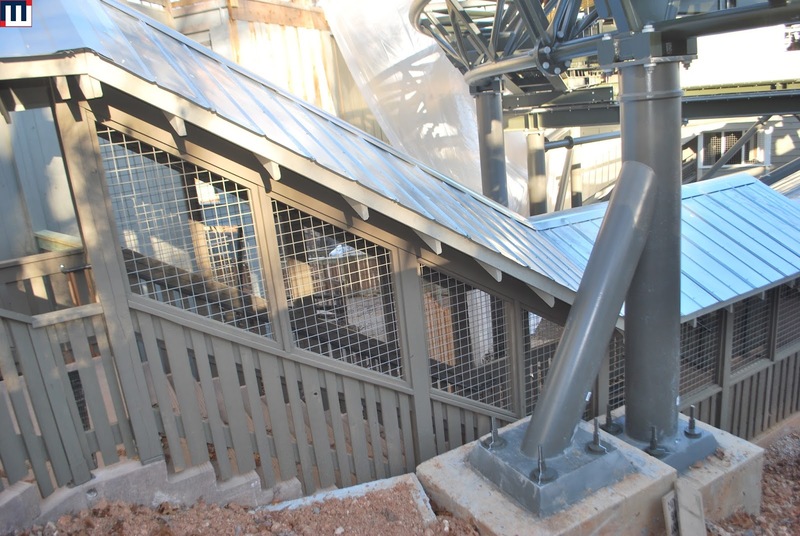 It looks like there will be a window for onride photos there on the deck. We are still not sure where the actual entrance will be located as the entrance queue just ends right here. I'm guessing it will have to be somewhere near the ThuNderaTion entrance. Again - "where the sidewalk ends"
They've added chicken coop wiring on the covered areas of the queue. You have to protect guests from themselves, and this is the easiest way to do it. They've added more siding to the bridge area. It will be interesting to see what the final product will look like.